This book was so, so good! From the very first pages, I knew I was going to love it. Of course, I am a big fan of Julie Kagawa already: I loved her Iron Fey series and felt sure that I would like anything else she wrote. What I didn't know, though, was just how much I would enjoy The Immortal Rules. At first glance, I thought, "oh, here's another vampire book," and didn't expect anything fresh on this much-exhausted subject. But, Kagawa proved me wrong, and delivers a fresh take on vampires. 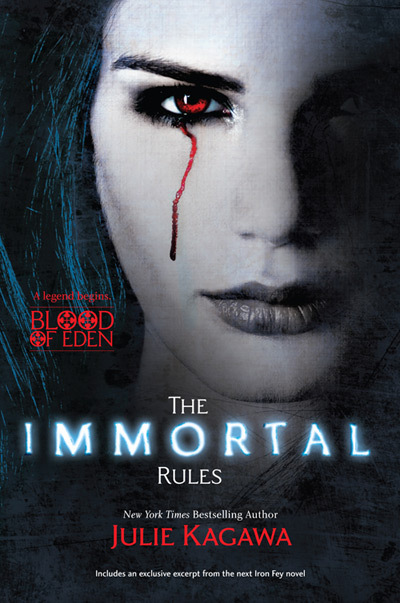 The Immortal Rules felt part dystopia, part paranormal to me. At first, Allison is your typical post-apocalyptic survivor type human. Every day is a struggle just to get enough food to eat and to avoid being taken by the vampires in the city. Allison is an unemotional girl who is always thinking about how to get through another day. That's not to say she doesn't have feelings, she's just good at pushing them down in order to survive. Things change when Allie and her friends are attacked by a pack of rabids. She is left for dead, but saved by a vampire. And that is when the story really gets interesting. Allie is torn between two worlds: her old life as a human and her new life as a vampire. (I promise that telling you this is not a spoiler, as these events occur early in the book and are in fact, described in the summary). I loved the first person narrative, as it allows the reader to really know Allie. It would be hard to know her from a third-person point-of-view, as she keeps her emotions so hidden and closed off to everyone around her. Kagawa's writing style is a little different from the Iron Fey series: The Immortal Rules is written more starkly, which goes well with the theme of the book. I loved the slow build of the romance, as well as the forbidden aspect of it (forbidden love gets me every time). I thought the ending was fitting, and it provided enough closure but left me eagerly anticipating book two. There were some surprises towards the end of the book, which I loved. Just when I thought I had the plot figured out, Kagawa surprised me, which made me love the book all the more. There was a surprise at the end of my ARC: a sneak peek of an Iron Fey spin-off featuring Ethan Chase. I usually don't like a male narrator, but I will definitely make an exception to read more from Kagawa. I would recommend The Immortal Rules to just about anyone----and I just can't wait for the next book in the series! Looking forward to read this one. So glad you enjoyed it. :) I've yet to read the Iron Fey series and I really need to play catch-up! Great review and I need to add this book to the reading pile, since I have heard such great things about it. Okay...the front of the book looks freaky and if I saw it in the book store I would never pick it up. However, this review looks great, you have such a beautiful way with words...so I might just read an excerpt on something and see what I think. Thanks. I agree that this would not be as good in 3rd person. Allie's head is necessary to understand to appreciate the story. I adored this book. Great review!